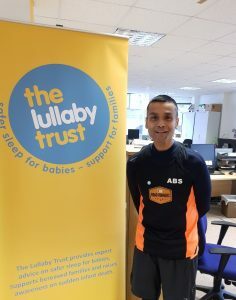 My name is Abir Ali and I am doing the London Marathon in April for The Lullaby Trust, the UK’s leading charity in aiming to prevent unexpected deaths in infancy and promote infant health. They fund research, support families whose babies have died suddenly and unexpectedly, spread information on infant health, baby care and sudden infant deaths to both health professionals and the general public, and work with professionals to improve investigations when a baby dies. I have a personal connection to the charity’s work, as I lost my son, Charlie in 2004 after only 3 weeks. In 2012 I decided to raise funds and awareness for the Lullaby Trust by running events – from 10k races to half and full marathons. To date, I have done 150 events and raised nearly £8,000 through Justgiving. The charity have been a great help recently, with advice that has helped my daughter Esme (who is now 7 months old and my companion at Parkrun). Last February, I visited the Lullaby Trust offices, in London, to meet some of the 55 strong members also doing the London Marathon. The day involved getting to know a few members of the team and going for a 10k jog in Battersea Park. Before the end of the day we all discussed our experiences, and it transpired that I was the only one in a running club; naturally I told them the benefits of joining one – and they were certainly all amazed by the prospect of a reward of cake at the end of each club run! I told them that running clubs offer coaching, advice, moral support, friendship and can help you reach your training goal. Running clubs (especially BTR Road Runners) cater for everyone from the super-competitive to the recreational jogger. The team atmosphere can instigate big improvements in your performance, provide enduring memories, experiences – oh, and cake. Did I mention cake before? It really is an honour and a privilege to be part of such a fantastic running club.